Some sources report that Icbit may be engaging in hidden market manipulation against their customers’ interests, although there is insufficient evidence to confirm or deny this conclusion. Always tread carefully when trading on the Bitcoin markets. Ever since Bitcoinica shut down following the hack on May 11, the Bitcoin economy has lacked a way of betting for or against the Bitcoin price at leverage. While it is always possible to buy bitcoins and sell them, what Bitcoinica allowed users to do was to use a small quantity of bitcoins as collateral to hold a much larger quantity of virtual bitcoins or USD, balanced out with a negative balance in the other currency, allowing anyone to realize much higher losses and gains off of a limited amount of capital than can be achieved through simple trading, and also allowing traders to change their positions in any direction instantly without having to wait days for deposits at Bitcoin exchanges to process. Furthermore, because margin trading allows users to hold a negative quantity of bitcoins, Bitcoinica allowed users to profit when the price dropped – a possibility which many believe had a valuable dampening effect on potential Bitcoin bubbles by providing an economic outlet for traders to express their caution. Almost immediately after Bitcoinica shut down, the three-month period of extreme price stability that had prevailed since mid-February ended, and the Bitcoin price began slowly rising. Some are concerned that without the economic tools that Bitcoinica offered, there was nothing to prevent the current rally from turning into another bubble and crash like that seen last June. Also, margin trading tools have another valuable use: they allow merchants to cancel out the exposure to Bitcoin price movements that they naturally get from holding currency for operational purposes, and with no such service available managing risk for Bitcoin merchants becomes considerably more difficult. However, for the past several months, a new competitor has been slowly growing to fill the niche: icbit.se. Icbit was first launched in November 2011 with little fanfare, as the original margin trading service, Bitcoinica, was in full swing at the time. Throughout winter and spring 2012, the site continued to slowly and progressively add features, and it was not until July that the number of users started to pick up. Since then, growth is once again at a relative standstill, and the site is processing a relatively steady 2000 BTC per day on its exchange and 1500 BTC per day in the “futures” section, the part that allows Bitcoinica-like margin trading. 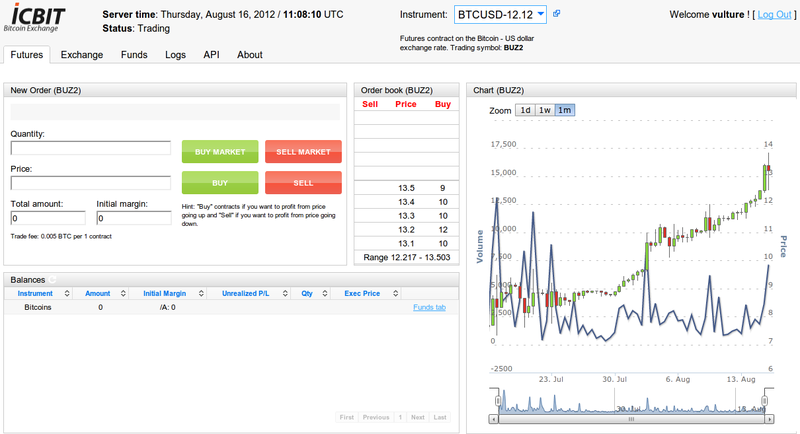 The site differs from Bitcoinica in two key ways. First of all, while Bitcoinica dealt directly in bitcoins and USD, allowing users to hold positive and negative quantities of each one, icbit.se accomplishes the same functionality using contracts called “futures”. Technically speaking, a futures contract is an agreement between two parties that one will sell a quantity of an underlying asset to the other at a given price at some pre-determined point in the future. For example, one might have a futures contract between A and B stating that A will sell one bitcoin to B for $13 on January 1, 2013. If the price of a bitcoin is $18 by then, A will be forced to buy the bitcoin on the open market and sell it at the reduced price, taking a loss of $5 that B will receive as a profit. For assets with low storage costs (a classification which Bitcoin fits perfectly), the price of futures closely follows the price of the actual asset, as when the two veer too far apart, it opens an opportunity for anyone to make a profit from arbitrage by buying one and selling the other at the same time. Icbit allows users to do all of this using a very simple interface. The buying and selling is abstracted away and the future is defined as a “difference contract”: if the price of a bitcoin is above $13 on the expiration date, A simply pays B the difference directly, and vice versa if the price drops below. Buying a future constitutes making a bet that the price will go up, and selling a future constitutes making a bet that the price will go down. Just like at a Bitcoin exchange, to buy a future on Icbit, one can either place an offer himself, which will remain on the orderbook until someone accepts it, or one can match someone else’s offer already on the books. When the order is filled, he and the other party are locked into the contract, and the process is complete. Selling a future follows the exact same process. It is possible to buy futures with a higher total value than the amount of BTC that you have deposited or sell futures without buying them first – the only limit is a requirement to have enough BTC deposited to be able to pay for a 10% change in the price – similar to Bitcoinica’s limit of 10x leverage. If the price rises or falls enough that your account’s net worth falls below zero, Icbit attempts to liquidate your position by making automatic transactions on the market, and if there are no asks or bids available the algorithm moves to a last resort of closing your futures early, forcing your counterparties to accept a limited, albeit generous, profit. There is currently only one futures contract sold, “BTCUSD-12.12″, which expires in December, but most users do not wait that long. If one holds a positive number of futures, he can liquidate his position by selling them, reducing his next exposure to zero and unlocking his margin balance, allowing him to immediately withdraw. If he holds a negative number of futures, he can buy futures to cover the difference to the same effect. Icbit automatically rearranges the counterparties behind the scenes so that when you liquidate and withdraw, the rest of the users can continue trading without disruption. The futures model can be applied to much more than trading bitcoins, and Icbit already has plans to that effect. Eventually, BTC-denominated futures contracts will be able to be made with not just BTC as an underlying asset, but also major indices and commodities like the S&P 500 and the Brent crude oil price. Theoretically, any stock, commodity, index or even arbitrary variable like the temperature can be used as a basis for futures contracts, so if the site continues to grow, it has plenty of room to expand. There is also one other key difference between Icbit and Bitcoinica: on Icbit, all transactions are made between the users themselves. While Bitcoinica had users trade with the service, employing an algorithm to buy and sell on MtGox to cover its users positions, Icbit allows the trades to happen by themselves, and only takes a flat fee of 0.005 BTC per 1 BTC in each contract as revenue. This model ensures that Icbit will be able to operate with less financial risk, a problem that Bitcoinica struggled with as its profits went from $100,000 per month to near zero in March due to a problem with the algorithm. The model will likely also ensure higher security, as the service can run without leaving as much money in a potentially vulnerable “hot wallet”. The problem with this setup is that liquidity is not guaranteed, a problem which Icbit is currently forced to alleviate by operating an algorithmic trader on its own service as a “market-maker”, but that is an issue that will resolve itself as more traders start using the site. Legality is another concern. Icbit is currently not registered anywhere as a financial services provider, and its operators would prefer keeping away from the eyes of the law entirely. The site’s front page features the cryptic phrase “ICBIT is not a place for money laundering, so we are not going to enforce any AML measures like ID verification requirement”, a claim which its operator clarified on a Bitcoin forum with the statement “Indeed it makes me quite worried if a bitcoin exchange becomes a central war place for money laundering practices. Officials should catch offenders at other places before they reach exchanges. Like, when they actually steal money, not when they try to launder.” There is reason to believe that the site will be able to maintain this position for some time. Icbit is still relatively small, and the service itself never handles any financial instruments other than bitcoins and AurumXChange voucher codes, making any attempt to shut the site down through the banking system unlikely. The GLBSE, which is much more prominent, has much higher volumes and has been around much longer than Icbit, still survives with its lax verification policies. However, it remains to be seen how this policy will survive its first major trial, whenever that may come. Icbit is still relatively small, and the high spreads that appear on the futures exchange as a result are a hump that the site will have to get over if it intends to see greater adoption. If it does, then it will be well on the path to becoming a fully fledged replacement for Bitcoinica, hopefully with greater security due to its more safety-oriented design. And if it does not, others will soon take its place. Icbit already has many challengers, and although none of them has managed to overcome the rigorous security and trust requirements of running a margin trading service, it is only a matter of time before one comes along that does. Regardless of which service, or services, become dominant in the end, one thing is clear: having been introduced to it once with Bitcoinica, margin trading is a service of which the community is unwilling to let go. Bitcoin Savings & Trust – Genuine or Joke?